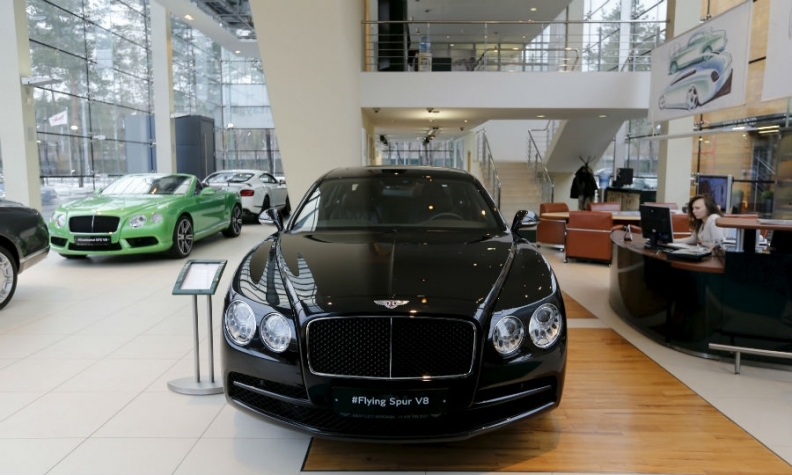 Bentley cars in a showroom in a luxury shopping mall outside Moscow. Bentley's Russian sales grew by 7 percent last year. MOSCOW (Reuters) -- More and more Porsche, Bentley and Rolls-Royce cars are appearing on Russian roads despite the country's economic crisis, as wealthy buyers take advantage of the weak ruble. It seems something of a paradox; while mass-market car sales in the country have tumbled along with the currency and oil prices, luxury cars are bucking the trend. Sales of Porsche, Bentley, Rolls-Royce and Lexus cars all rose last year, even as Russia sank into recession. "It's bizarre," said IHS Automotive analyst Tim Urquhart. "Even in the absolute depths of despair which the economy is in at the moment, these brands still seem to be doing OK."
Falling wages in the country have deterred many people from buying new cars in any price bracket, but for those Russians who can still afford top-of-the-range autos, it could be a good time to buy. The weaker ruble, which lost almost 20 percent against the dollar last year, means foreign-made luxury cars are considerably cheaper in Russia than elsewhere. A new Porsche 911 Turbo S cabriolet costs 11.8 million rubles ($151,687) in Russia, while in the U.S., the same model sells for $200,400. Maria Malinskaya, showroom head at the Rolf car dealership group, said some premium models were now two or three times cheaper in rubles than in dollars. Richer Russians have also stored their wealth in premium autos rather than volatile rubles, say analysts, as foreign-made cars have not traditionally depreciated as sharply in Russia as in the West. Russia's premium car market has come a long way since the 1970s when only three Mercedes reportedly drove on Moscow's concentric ring roads: one owned by then Soviet leader Leonid Brezhnev, the other two by world chess champion Anatoly Karpov and dissident songwriter Vladimir Vysotsky. Today, the wider Russian auto industry is suffering. After a decade of annual sales growth in excess of 10 percent, the sector has been hammered by a steep economic downturn since 2013 in major oil producer Russia, which has been hit by collapsing global crude prices and Western sanctions imposed over Moscow's actions in the Ukraine. New-car sales plunged 36 percent last year and are forecast to decline for the fourth year running in 2016, according to data from the Association of European Businesses (AEB). But few high-end brands are feeling the same pain. Bentley sales rose 7 percent year-on-year in 2015 and purchases of Rolls-Royce cars were up 5 percent. Porsche and Lexus, whose sales increased 12 percent and 6 percent respectively last year, according to AEB data, are the only two brands to have maintained annual sales growth in Russia since the market peaked at almost 3 million sales a year in 2012. IHS's Urquhart said: "There was an impulse move to put cash into a physical asset, a high-value physical asset, which helped a lot of the premium and ultra-premium brands." Porsche and Rolls-Royce said the devaluation of the ruble had supported demand for their vehicles. Their healthy sales figures also highlight the wealth disparity in Russia, brought into sharp focus by the economic downturn which saw real wages - adjusted for inflation - fall 9.5 percent in 2015, according to government figures. New cars are out of reach for many Russians. Prices for AvtoVAZ’s Lada Granta sedan, Russia's best-selling car last year, start at 368,900 rubles ($4,694). With the average monthly salary in the country at 42,684 rubles in December, buying even a new budget car like the Lada Granta represents most of a year's wages. At the luxury end of the market, the base price for a Rolls-Royce Ghost currently stands at 19 million rubles ($241,784), the UK carmaker told Reuters, enough to buy more than 50 Ladas. "Even in a crisis there are people who have money," said VTB Capital analyst Vladimir Bespalov. "Possibly, it is precisely in a crisis that they think it a good time to buy expensive cars."